With temperatures continuing to soar in Italy, the competitors of the EWC were once again put through their paces in the physically demanding GP Scorpion EXO of Italy. With some riders struggling to cope with the intense conditions, others shone bright. Cristobal GUERRERO (KTM) finally grabbed the victory he has shown to be capable of all season in Enduro 2 while KTM’s Eero REMES relished in the 35 plus degree heat to win Enduro 1. Hoping to repeat his winning result from day one, Finland’s Juha SALMINEN saw his chances dashed with a crash on lap three. Losing valuable time, the Husqvarna rider ended his day as runner up to GUERRERO. Returning to the podium for the first time since Argentina, Spain’s Ivan CERVANTES (Gas Gas) placed a much-relieved third. Continuing to establish himself as a real threat in Enduro 2, France’s Antoine BASSET (Yamaha) claimed an impressive fourth in the Enduro 2. Improving one position from the previous day, Italy’s Oscar BALLETTI (Beta) was fifth.Making amends for his numerous mistakes on day one, France’s Christophe NAMBOTIN (KTM) ended day two as the winner of Enduro 3. Enjoying a great fight with both Sweden’s Joakim LJUNGGREN (Husaberg) and Britain’s David KNIGHT (KTM), the Frenchman topped seven of the day’s 12 special tests to win by 12 seconds.“I learned a lot from my mistakes on day one and was much more controlled today,” remarked NAMBOTIN. “It was a good fight and was nice to put yesterday’s bad luck behind me to win.”Untroubled by the difficult rocky Italian terrain on day two, LJUNGGREN produced his best result of the weekend to finish second. Keeping touch with NAMBOTIN throughout the day, the Swede also held off a late charge by KNIGHT to secure a strong result. Hampered by a crash on the opening Extreme Test, KNIGHT fought back to place third and end his day 16 seconds behind NAMBOTIN.Estonia’s Aigar LEOK (TM) capped off a solid performance in Italy with fourth place on day two while Spain’s Oriol MENA (Husaberg) finished eight seconds behind the TM rider to complete the top five. In Enduro 1, Eero REMES (KTM) capitalised on the untimely exit of MEO to record his first win of the season. Spending the day trading positions with fellow countryman Matti SEISTOLA (FI – Husqvarna), REMES gradually extended his advantage during the final lap to top his class by almost 34 seconds. “I just tried to concentrate on my own race today and it paid off,” confirmed REMES. “My speed was strong all day and I didn’t make any mistakes. I hope to use this result as a confidence booster leading into my home races in Sweden and Finland in two months time.”Pushing too hard during the opening two laps, SEISTOLA began to suffer from the intense Italian heat. Unable to maintain pace with REMES, SEISTOLA eventually slipped back behind the KTM rider to finish second. Italy’s Thomas OLDRATI (KTM) delivered a solid result on home soil to end day two third overall in Enduro 1.Rapidly improving on his day one result, France’s Rodrig THAIN (Honda) jumped four places to finish fourth while Sherco’s Fabien PLANET (F) completed the top five. Italy’s Jonathan MANZI (KTM) secured a sensational win in Enduro Junior. Faced with a highly motivated Argentinean, Kevin BENAVIDES (KTM), the young Italian held on to secure victory by less than one-second. With BENAVIDES missing out on the win by the narrowest of margins, championship leader, Mathias BELLINO (F – Husaberg) completed the top three, albeit some 38 seconds behind the leading duo.Italy’s Nicolo MORI (TM) claimed his best result of the year to finish fourth and beat fellow Italian Rudi MORONI (KTM) by two seconds.Winning all 12 of the day’s special tests, Italy’s Giacomo REDONDI (KTM) easily topped the Enduro Youth Cup. Guido CONFORTI (I – Yamaha) repeated his day one result of second while Husaberg’s Matteo BRESLOIN (I) completed the top three. It was yet another dominant display of riding from Gas Gas’ Laia SANZ as she recorded her second victory of the weekend. However, drama struck the Spaniard when she suffered a suspected broken foot during the final Extreme Test. Completing the rest of the lap in intense pain, she managed to finish and claim the win by almost three minutes over France’s Ludivine PUY (Gas Gas). With PUY finishing second, France’s Audrey ROSSAT (KTM) was a distant third. Samantha TICHET (F – Husqvarna) and Jemma WILSON (AUS – Honda) completed the top five. David KNIGHT returns to his winning ways as he secures a much-welcomed victory in Enduro 3. Juha SALMINEN places his Husqvarna back on top to win Enduro 2 while KTM’s Antoine MEO puts in a last lap dash to steal victory in Enduro 1 at the Maxxis FIM Enduro World Championship Scorpion GP of Italy. After a six-week break since round four of the series in Portugal, the EWC returned to action with a bang at Castiglion Fiorentino, Italy. With temperatures reaching as high as 35 plus degrees, day one of the fifth round of the championship was a real test of attrition for all the competitors involved. Along with David KNIGHT (GB – KTM) winning Enduro 3, fellow British competitor Jane DANIELS (Husaberg) also reached the podium of the Women’s Cup in her debut EWC ride. In what was her first ever enduro competition; the 18-year old grabbed a sensational third overall in the Women’s Cup. However, there was also upset for numerous riders as the heat began to take its toll on both man and machine. 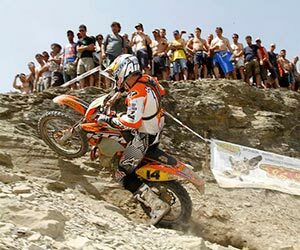 France’s Johnny AUBERT (KTM) was first to fall foul when a technical issue ruled him out on contention in Enduro 2. Britain’s Jordan ROSE (TM) and Spain’s Mario ROMAN (KTM) were also forced to retire due to injury. Finland’s Juha SALMINEN (Husqvarna) returned to form in the Italian sunshine to claim victory in Enduro 2. Finding the dry, dusty and rocky terrain exactly to his liking, SALMINEN secured a well deserved win. “I felt comfortable all day and didn’t have any problems. My speed was strong and I’m happy with how I rode,” said SALMINEN after the podium celebrations. “Although Cristobal was fast on the Enduro Test I was able to gap him on the other two tests to control my advantage. It’s nice to win again and I hope to repeat this result tomorrow.”As the only rider to challenge the hard charging Finn, Spain’s Cristobal GUERRERO (KTM) ended his day as runner up. Setting some of the fastest times of the day on the Enduro Test, GUERRERO finished less than 18 seconds behind the Husqvarna rider to card his sixth podium of the season. Behind the top two, championship leader Pierre-Alexandre RENET (Husaberg) fended off a late charge from Spain’s Ivan CERVANTES (Gas Gas) to grab third. With CERVANTES ending his day in fourth, France’s Antoine BASSET (Yamaha) delivered his best result of the year to place fifth. In Enduro 3 Britain’s David KNIGHT made a welcome return to the top step of the podium. Finding some fast and smooth lines in the crucial Extreme Test, the KTM rider was able to maintain his advantage throughout the day. Putting an end to Christophe NAMBOTIN’s eight-race wining streak, he topped his class by almost 18 seconds.“I didn’t expect to win but it feels good to finally do so,” smiled a very pleased KNIGHT. “I just tried to keep consistent today and managed to remain relatively mistake free. I’m so happy to finally be back on the top step of the podium.”After what has been an incredible run of form so far this season, NAMBOTIN (F – KTM) was unable to match the pace set by KNIGHT and had to be content with second. Hampered by a couple of small crashes, the Frenchman ended his day in second place. Sweden’s Joakim LJUNGGREN (Husaberg) rode a lonely race to finish third. Finishing 30 seconds behind the leading duo, the Husaberg rider also placed almost 30 seconds in front of his teammate Oriol MENA (S). Enjoying the tough conditions, MENA beat Estonia’s Aigar LEOK (TM) to place fourth with LEOK finishing 25 seconds further back in fifth. France’s Antoine MEO (KTM) made a last lap charge in the scorching Italian sunshine to record his eight victory of the season. Admitting to struggle with nerves during the early morning tests, MEO almost failed to finish when he crashed hard on lap two and twisted his knee. Strapping the injury, the Frenchman dug deep to overhaul the hard charging Husqvarna mounted Matti SEISTOLA (FI) to secure victory.“My grandparent live quite close Castiglion Fiorentino so it felt like a home race for me. I put a lot of pressure on myself to win here and it caused me to make many errors,” confirmed MEO. “I crashed hard on the Enduro Test and hurt my knee. After strapping it up, I pushed incredibly hard and managed to win.”Showing that he has put his difficult start to the season behind him, Finland’s Matti SEISTOLA lead the way throughout most of day one in Italy. However, unable to hold back the late charge by MEO, the Finn was forced to settle for second. Challenging SEISTOLA throughout most of the day, Finland’s Eero REMES (KTM) finished just three seconds behind his fellow countryman to place third.Behind the top three, the Italian duo of Simone ALBERGONI (Honda) and Thomas OLDRATI (KTM) engaged in a daylong battle for fourth. With little to separate each other, OLDRATI eventually got the better of ALBERGONI to secure fourth and pushed the Honda rider back to fifth. In Enduro Junior France’s Mathias BELLINO (Husaberg) recorded his seventh win of the year. Building a lead during the opening lap, the Husaberg rider was forced to fight his way back into contention after a costly crash in the Extreme Test on lap three. Battling hard with Italy’s Jonathan MANZI (KTM) during the final lap he narrowly beat his rival by 11 seconds to claim victory. Sensing a home win, MANZI pushed hard for victory on the final lap but couldn’t beat BELLINO and finished as runner up to the Frenchman. Finding hot conditions similar to home, Argentina’s Kevin BENAVIDES (KTM) completed the top three. Britain’s Danny MCCANNEY (Gas Gas) was fourth, while Italy’s Edoardo D’AMBROSIO (KTM) rounded out the top five.Italy’s Giacomo REDONDI (KTM) delivered a winning result to win the Enduro Youth class. Guido CONFORTI (I – Yamaha) was second with Matteo BRESOLIN (I – Husaberg) rounding out the top three. Spain’s Laia SANZ (Gas Gas) was the clear leader in the Women’s Cup. Making light work of the technically demanding Extreme Test, she went on to claim victory by over five minutes. Unable to match the pace set by her teammate, France’s Ludivine PUY (Gas Gas) finished a distant second. Keeping touch with PUY during the early part of the day, DANIELS held on to finish an impressive third overall. Sweden’s Jessica JONSSON (Gas Gas) and Australia’s Jessica GARDINER (Yamaha) completed the top five. KTM Enduro factory riders rose to the occasion at Rd. 9 & 10 of the GP of Italy in Castiglion Fiorentino, closing out a good weekend on Sunday with across the board wins in E1, E2 and E3. 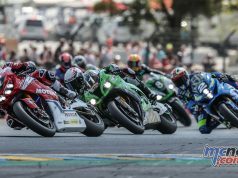 Eero Remes, Cristobal Guerrero of Spain and French rider Christophe Nambotin scooped all three classes on Sunday to add to wins by Antoine Meo and David Knight on Saturday. This went a long way to neutralizing the disappointment of a DNF by Meo on Sunday and a double DNF by Johnny Aubert. Remes, who was third on Saturday in E1, was the fastest in all cross tests and never finished lower than fourth in any of the 12 tests held in Italy’s blistering summer heat. With Johnny Aubert off the E2 results sheets it was also a fine performance by Guerrero who was a model of consistency throughout Sunday to emerge on top of the E2 class. The E3 on Sunday was firmly in the hands of Nambotin who won seven tests and was a consistent finisher in the remaining five. Together with his second place finish after teammate David Knight on Saturday the Frenchman picked up another slew of points to add to his leadership position. Meanwhile it was a renaissance weekend for David Knight who added a third place podium on Sunday to his confidence-building win on Saturday. Knight competed for the first time on the KTM 300 EXC, a switch to the 2-stroke machine after more than a decade on the 4-strokes. He now looks set to deliver a better showing in the second half of the season. “I felt I needed to try something new,” David told enduro21.com prior to the technical control on Friday afternoon in Italy. “Something hasn’t quite clicked this year and I’m not sure why. I feel like I’ve been riding good and although the four-stroke is bigger, it’s also better than before yet my times still weren’t there. I think there’s been a shift in events. This season the special tests have really suited the lighter and nimble two-stroke.” David first tried the 300 EXC in the recent Erzberg Rodeo and decided he would make the switch. Sunday’s EJ class also went to KTM with Italian Jonathan Manzi quickest home and Kevin Benavides of Argentina in second. The two riders finished 2-3 on Saturday.